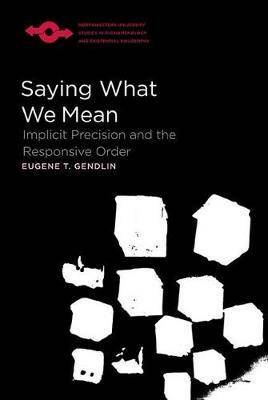 The first collection of Eugene T. Gendlin's groundbreaking essays in philosophical psychology, Saying What We Mean casts familiar areas of human experience, such as language and feeling, in a radically different light. Instead of the familiar scientific emphasis on what is conceptually explicit, Gendlin shows that the implicit also comprises a structure that can be made available for recognition and analysis. Developing the traditions of phenomenology, existentialism, and pragmatism, Gendlin forges a new path that synthesizes contemporary evolutionary theory, cognitive psychology, and philosophical linguistics.